It is with great pride and excitement I must announce that Twitter has done it again and produced some of the funniest tweets the world has ever seen. Topics covered this month included the now officially banned 'don't say it' meme, the absence of cellphones enhancing life experiences, Thanksgiving outfit practicality queries, the early days of Apple Pay and the intricacies of ordering a Subway. The fact of the matter is that in these trying and uncertain times, all we can do is cry, then momentarily stop crying to enjoy some dank tweets. That's it. That's all we have left. Here's 25 funny tweets from November. Enjoy em, champ! if i had to come up with a slogan for raccoons it’d definitely be “dogs and hands, together at last"
The best part of being a flight attendant has to be when you walk the aisle saying “trash” to everyone’s face. 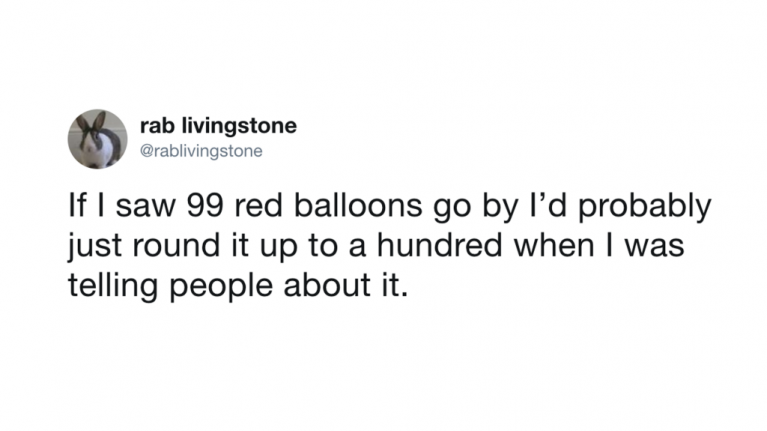 If I saw 99 red balloons go by I’d probably just round it up to a hundred when I was telling people about it. At the first Thanksgiving, do you think any pilgrims ate so much they had to loosen the buckle on their hats?